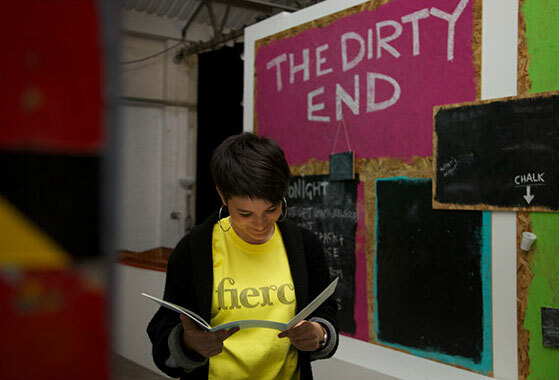 October 2013 sees Fierce Festival celebrating its 15th anniversary. This is your chance to be involved in this very special festival year. Fierce Festival returns from Friday 4 to Sunday 6 October. The festival was founded as Queerfest in 1998. Since then it has constantly evolved and redefined itself. Taking over venues across Birmingham and Warwick Arts Centre, this year we need a team of dedicated volunteers to help us deliver the festival which will include theatre, music, installations, public interventions, workshops, talks and parties. True to tradition, spectacular large scale projects will collide with agenda setting events and wild parties. Works have been developed, restaged or commissioned specific to Birmingham. They will take place in warehouses, local art centres, up-and-coming galleries, historical sites, streets and disused commercial spaces. – You will meet great artists and other like-minded people. – Have the opportunity to play a key part in the running of an internationally recognised festival. – Plus you’ll get free tickets to Fierce’s club party, concession price on the See-Everything Festival Ticket (subject to availability), a much sought-after staff t-shirt, and invite to the post festival volunteers knees-up! – Act as a main point of contact for information about the festival, the programme and the city for visitors from near and far. Eligibility: You need to be over 18 years old, available between 24 September and 16 October and able to commit to a minimum of four shifts over the period. Application: Please to fill out the application form, available to download here and email it to sadie@wearefierce.org by 5pm, Thursday 5 September 2013.